Thank you for your prayers, gifts and donations to With One Accord Ministries! A Raw, Nourishing & Tasty Lift For Winter Doldrums! 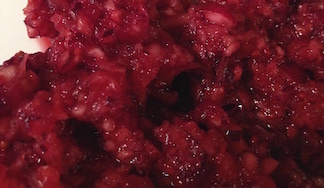 Using a food processor, measure out roughly half of the cranberries. Peal the apples and cut in half to core. Zest orange. Peel orange and cut in half. Process 1 apple and ½ the orange, add 1 TLBS lemon juice, half the zest. Add a few squirts of stevia and 2 TLBS honey and process until desired texture is achieved. Remove and process the second batch. Taste and add more sweeter to taste. ENJOY! This is good when you keep it nice and tart!